We understand that people lead busy lives, that's why we offer our personal, friendly oven cleaning service at times that suit you. We will deep clean your oven or hob and remove all traces of grease and burnt on carbon using non-caustic and non-toxic cleaners. You won't find better oven cleaning prices, standards or aftercare because we take pride in making sure every customer is satisfied and uses our services time and time again. Please take a look at some of our customer reviews to see what our clients think of our oven cleaning services. 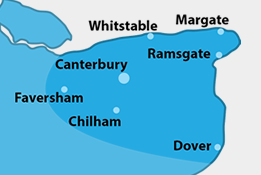 Our oven cleaning services are available across the East Kent area including; Canterbury, Thanet, Whitstable and beyond. Are you coming to the end of your tenancy? Call City Oven Cleaning to take care of your dirty oven. Lately we have been asked to clean several ovens that have been permanently damaged by cheap oven cleaning products purchased from discount high street stores. These products have damaged the enamel and bleached the interior of the oven, which once done cannot be removed..
To have your oven professionally cleaned, call us today! !